Doors at 7pm. Music at 8:30pm. Get advance tickets here. Follow the event on Facebook for important updates. 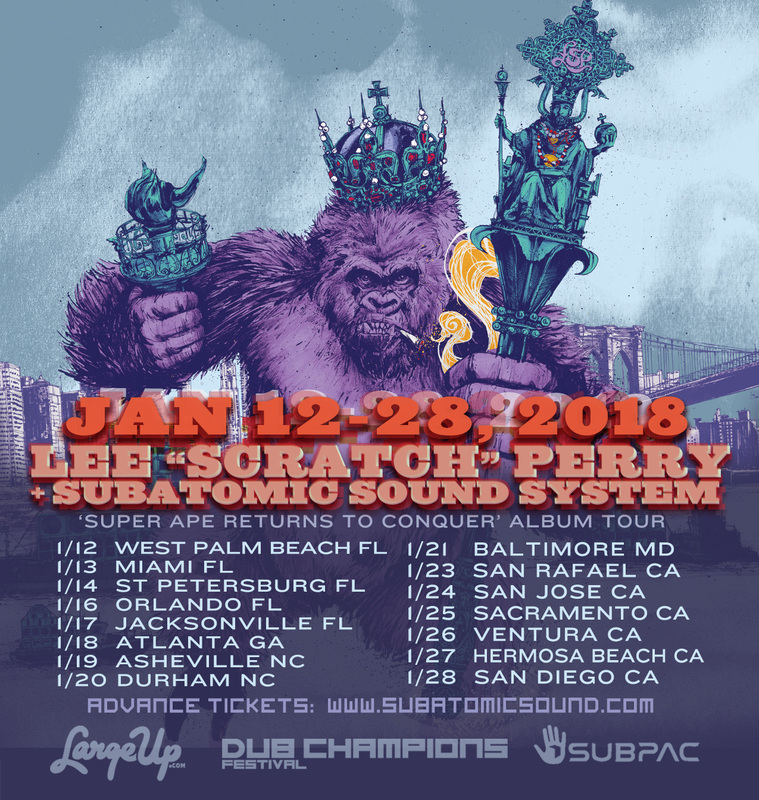 Lee Scratch Perry & Subatomic Sound System live on tour across North America Jan 12-28 for Dub Champions Festival in support of the top ranking new “Super Ape Returns To Conquer” album. After Lee “Scratch” Perry defined dub music with his seminal 1976 Super Ape concept album, the musical genius, at age 81, returns with Subatomic Sound System showing off a new style on a new album, Super Ape Returns to Conquer, which reincarnates the magic of Perry’s Black Ark studio in Jamaica, digging even deeper in classic Ethiopian horns & percussion, while reinvigorating the sound with beats for today’s music heads. Perry’s live concert with NYC’s Subatomic Sound System is a fluid combination of improvisational electronic and acoustic-based performance. Subatomic is spearheaded by producer/instrumentalist/DJ Emch on the live dub mix and includes legendary Jamaican percussionist Larry McDonald and Troy Shaka Simms (Brooklyn Gypsies) on saxophone. After mentoring and producing Bob Marley at a turning point in his career, Perry went on to create a blueprint for where most music has arrived 41 years later. Today it is commonplace for a producer to be considered an artist, work from a home studio, sample and remix existing songs, and have the beat and bassline at the forefront of the song, perhaps replacing singing with rhythmic talking or with echoes and effects and no vocals at all. In 1976, it was unheard of, and even unacceptable, but Perry did it. Subatomic Sound System first worked with Perry in 2007 doing a series of dubstep remixes for Dubblestandart. Subatomic also produced music involving David Lynch, Anthony B, Elephant Man, Ari Up of The Slits, and more. At the forefront of dub music’s renaissance, Subatomic founded the US & Europe Dub Champions Festival, toured worldwide with Perry, performing at major festivals including Coachella, Red Bull Music Academy, Ableton Loop Berlin, SummerStage, Ozora and more.